Metal Gear's most memorable moments are typically hands-off. Watching Snake exhibit his close quarters combat skills or Ocelot spin his revolvers like a supernatural juggler makes the espionage action--no matter how tactical--feel dull in comparison. But the flair of Metal Gear Rising: Revengeance's gameplay goes toe-to-toe with that of its cutscenes. Every press of a button yields a near-divine level of flash as Raiden slashes with his sword, dancing around the battlefield in a wild display of style. Even when Revengeance falters, the spectacle of its action quickly disembowels any concerns generated by its few shortcomings. 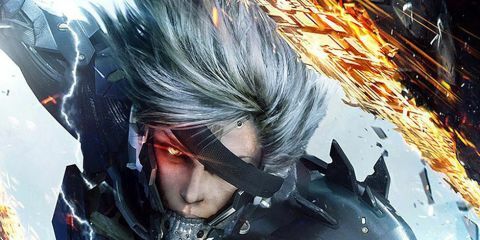 Platinum Games' action-heavy take on Kojima Productions' Metal Gear series is a mostly faithful addition to the franchise, and it's littered with the things that Kojima faithful have come to love. An exclamation point sprouts from the heads of alerted enemies; lengthy codec conversations and cinematic sequences punctuate the action; bosses yammer on and on about political ideologies before dueling you to the death; and you can even hide in boxes to stay hidden from foes. These nods aren't just tossed in purely for fan service, either. They're often the punchline of jokes that highlight how silly some Metal Gear tropes really are. You'll crack a smile once Raiden finds a cardboard box to hide under, but upon doing so a brief codec conversation with one of his accomplices points out just how ridiculous it is for a badass cyborg ninja to stow away in a crate of medical supplies. You'll really get a sense of the playful, collaborative relationship between Platinum Games and KojiPro thanks to these delightful wisecracks. At times they make Revengeance seem like a Metal Gear parody, but the laced laughs are right at home within the scope of its over-the-top personality. "You'll really get a sense of the playful, collaborative relationship between Platinum Games and KojiPro..."
Revengeance takes itself seriously when it needs to, though. The central plot revolves around the agenda of Desperado Enforcement, a seemingly evil private military company obsessed with reigniting worldwide conflict after the events of Metal Gear Solid 4: Guns of the Patriots. There's plenty of commentary here surrounding the prevalence of cyborgs in Revengeance's fiction--eventually Raiden is forced to acknowledge that most of the enemies he kills, while enhanced by robotic technology, are still human--and the narrative takes some surprisingly dark turns. The drama isn't quite on par with the conspiracy-riddled (and often convoluted) Metal Gear plots penned by Hideo Kojima, but the story is a great vehicle for moving from battle to battle--and this is where Revengeance shines the brightest. Combat reaches previously inconceivable levels of over-the-top, where the tamest thing you will do is slice a giant robot into at least one hundred pieces. Basic attack combos, while flashy and fun, are lacking in variety--but the real highlight is Blade Mode. Using it slows things down, giving you ample time to slice enemies at any angle, cutting straight through them in the process. Even after multiple playthroughs, Blade Mode is such a novel concept that it never becomes dull; there's nothing quite like ending a lengthy throwdown with an armored Gekko by sliding underneath it, activating Blade Mode, and gracefully turning its legs into shrapnel while maintaining your slide. "...Blade Mode is such a novel concept that it never becomes dull." It's not an overpowered mechanic, either, because all but the most basic of enemies require you to beat 'em up for a while before they can be insta-killed. But surviving the hack 'n slash phase can be extremely taxing. You'll have to rely on parries if you hope to endure, as there's no easier alternative for deflecting incoming damage. Unfortunately, the parrying control scheme leaves room for a lot of error. Even when you think you've nailed it perfectly, you might find Raiden on the receiving end of a devastating attack. Though battles are fantastic, the same can't be said for the environments in which they take place. You'll frequently feel like you're running through generic locations devoid of all but a handful of things to kill and some environmental decorations that can be cut into bits just for the hell of it. Most of them at least give you plenty of space to move around in, but too often do they feel like a barebones playbox. "...too often do [environments] feel like a barebones playbox." A bigger disappointment, however, is that many of Revengeance's cast of villains is almost just as bland. Rarely is there any buildup for these encounters; you'll meet most bosses for the first time moments before cutting them down. This feels like a huge missed opportunity for character development and establishment, especially when compared to the stellar villain track record of previous Metal Gear games. Emerging victorious after grueling battles with woefully underdeveloped antagonists just isn't all that meaningful or rewarding. That's not to say that fighting them isn't awesome, though, as boss encounters will test every ounce of your skill (and happen to the backdrop of some really incredible music). Even when you're not facing off against the primary cast of villains, you'll have to take on hulking robotic monstrosities. Within the first hour you'll fight a Metal Gear Ray mano a mano, slashing away at its armor until it launches about two dozen missiles at you--at which point you'll hop along said missiles like a series of stepping stones before slicing the mechanized beast cleanly in half. You'll be in control of Raiden for most of such encounters, with a dose of QTEs thrown in during the more cinematic sections of a long winded fight. But no matter the method of your input, everything on screen will make you feel like the biggest badass on the planet because you're making it happen. "...everything on screen will make you feel like the biggest badass on the planet..."
There's a ton to keep you coming back for more after you've finished the game, too. Levels are rife with hidden collectibles, and the vast number of unlockable perks--including new combos, weapons, and passive upgrades--are great incentives for replaying levels in an attempt to obtain an 'S' completion rank. And, in typical Metal Gear fashion, there are several VR Missions perfect for testing your mettle if you're looking for a new challenge. The collaborative efforts of Platinum Games and Kojima Productions culminate in an absurdly exciting action game grounded in the Metal Gear universe. Revengeance is unapologetic in the way it indulges your greatest power fantasies, often doing so with such a grandiose display of style that you'll be unable to wipe that ever-present smile from your face. It's fast, flashy, and fun--and it's easy to excuse Revengeance's hiccups when even the simplest battles rival the best cutscenes in any previous Metal Gear. This game was reviewed on Xbox 360 and PS3. Description The newest entry in the Metal Gear series, this one stars the once hated Raiden with no Solid Snake to be seen.